Villa Sandra Guesthouse v Malapascua Island, Filipíny: Zarezervujte nyní! restaurant is decorated with recycled glass bottles, lots of hand-made dreamcatchers, art and colorful fairy lights. The guesthouse is full of paintings made by many creative artists from all over the world, and a Freedom Wall where anyone can leave any message for other travellers. All the beds in the guesthouse are equipped with mosquito nets. We offer free accommodation and food to artists willing to paint something beautiful on the walls or musicians willing to give live music concerts at the guesthouse! We have a spacious chill-out area upstairs with lots of hammocks, surrounded by nature. From there you can climb on the guesthouse's rooftop where you can enjoy the best view on the island for seeing the spectacular Malapascuan sunsets over the sea! Guests staying at VS can enjoy free WiFi, unlimited drinking water and toilet paper, cooking facilities and fridge. VS has been awarded five stars by Trip Advisor from happy backpackers reviews. Our restaurant uses fully organic local produce, with some ingredients (veggies, fruits, roots and herbs) home-grown here in VS, and the rest bought fresh from the local markets, no pesticides. Our food portions are not only huge, filling, healthy and delicious, but also come at an affordable price. We invite everyone who wants to be a part of the change on the island, to volunteer at our feeding, education and games program for island children on every Saturday, with the collaboration of Go Green Malapascua and De La Mano Por El Mundo organizations. We educate children about the plastic problem in our country, play fun games with them and feed them. A percentage of the hand-made charity island souvenirs&jewellery sold in Villa Sandra goes towards the support of these programs! There are many things to experience on the island; diving, boat trips, snorkeling, cliff jumping, beautiful beaches, basketball, Filipino food, fiesta and the local disco every Saturday. Villa Sandra is in the centre of The Village and is close to local shops and bakeries, two minutes away from the port (where you will arrive), and a five minute walk to Bounty Beach, where most of of the island’s dive shops are. The nearest chill out beach is Tepanee's, a 5 minute walk, where you can snorkel all the way to tiny Dakit-Dakit island to see beautiful corals and schools of fishes. 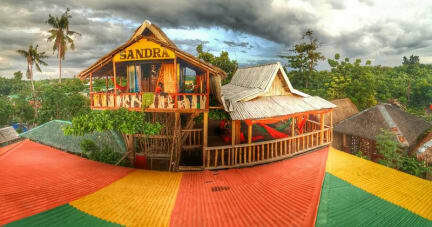 Villa Sandra also offers snorkeling gear for rent. 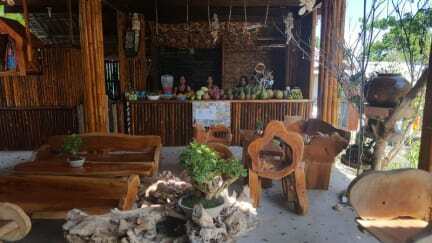 The locals in Malapascua are friendly and like to talk to travellers. They may even ask you to join them for a drink or food!